Stojan Stojanovski took these great images of the May 9, 2016 Mercury transit from Ohrid, Macedonia. Mercury crossed the sun's face from Earth's perspective for the first time in a decade Monday (May 9), and skywatchers around the world took in the rare celestial sight. Mercury popped onto the solar disc at 7:16 a.m. EDT (1116 GMT) Monday and departed more than 7 hours later, completing the first "Mercury transit" since 2006 and the last until 2019. Observers around the world were ready, and many of them captured stunning shots that showed Mercury as a tiny black dot against the huge, blazing backdrop of the sun. Shreenivasan Manievannan took this photo of the May 9, 2016 Mercury Transit from the San Francisco Bay Area. 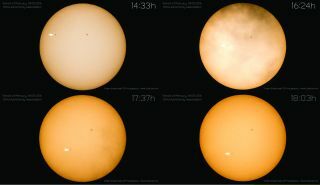 "To my pleasant surprise, the conditions improved a bit when the sun became bright to provide just enough clouds to act as a solar filter, allowing me to see the Mercury transit along with a prominent sunspot 2452, through the racing fog/clouds," Manievannan told Space.com via email. Dave Anderson also captured Mercury and the sunspot, in an amazing photo taken from Wichita, Kansas. In the shot, the sun takes on a deep and gorgeous reddish-orange hue. "He used a Celestron 5.5-inch telescope, 2X barlow, and a Nikon D810 camera," Anderson's wife Pamela told Space.com. "There was a lot of cloud cover, but he was able to shoot through some breaks." Dave Anderson took this gorgeous photo of the Mercury transit of May 9, 2016 from Wichita, Kansas using a Celestron 5.5" telescope, 2X barlow and a Nikon D810 camera. A sunspot is also clearly visible in the image. Like solar eclipses, transits of Mercury (and of Venus, which is also closer to the sun than Earth is) must be viewed very carefully using telescopes equipped with special filters and/or projection techniques; otherwise, serious and permanent eye damage could result. Samuel Hartman of State College, Pennsylvania used projection to get a unique and striking image of the transit. "The image looks like it was taken with a solar filter, but it was not," Hartman told Space.com. "The photo is a corrected color projection image. The only paper available to me at the time of the shot was glossy paper, which unintentionally (but quite excellently) produced an interesting image. Despite lacking nearly all the proper equipment, I think the observing turned out quite well." Samuel Hartman captured this shot of Mercury's May 9, 2016 transit from State College, Pennsylvania by projecting the image onto glossy paper and later color-correcting it. Mohammad Baqir of Quetta, Pakistan also projected the Mercury transit onto a sheet of paper, where he — and his pet duck — could safely view the event. Physics lecturer Mohammad Baqir and his pet duck observed the May 9, 2016 Mercury transit using safe projection techniques. Mercury transits occur 13 times every century on average. They're so rare because the orbit of Mercury is about 7 degrees out of plane with that of Earth; as a result, the two planets and the sun just don't line up all that often. Venus transits are even more rare, because Earth's so-called "sister planet" circles the sun much more slowly than Mercury does. Venus transits occur in pairs eight years apart, with each pair separated by the next pair by more than 100 years. There have been just eight Venus transits since the telescope was invented in the early 1600s — in 1631, 1639, 1761, 1769, 1874, 1882, 2004 and 2012. The next one won't happen until 2117. Editor's note: If you captured an amazing photo of the Mercury transit, or any other celestial sight, and you'd like to share it with us and our partners for a story or image gallery, send images and comments in to managing editor Tariq Malik at spacephotos@space.com.